Comedy writer Alan Zweibel, from left, HeadCount executive director Andy Bernstein, Hip hop recording artist Common, left, Woodstock co-producer and co-founder, Michael Lang and musician John Fogerty participate in the Woodstock 50 lineup announcement at Electric Lady Studios on Tuesday in New York. 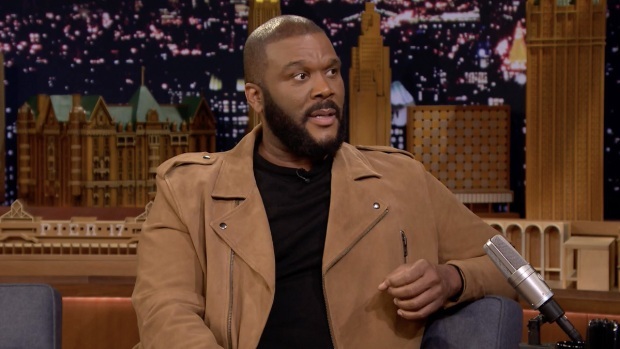 Tyler Perry talks about living his best Instagram life and getting outsmarted by his toddler son and Beyoncé and Jay-Z's daughter Blue Ivy Carter. Dale Earnhardt Jr. reveals how he ended up in Jay-Z's "Show Me What You Got" music video, the amazing dinner he had with the Carters afterward and his transition from NASCAR superstar to commentator.